We are in love with this new Stampin’ Up! Incredible Like You Project Kit, and we know you will be too when you see it on the Stampin Scoop Show today. With it’s delicate laser-cut overlays let the color peek through on these all-occasion cards. Store or gift your cards in the reusable storage envelope. Out of the box, the kit makes 16 cards, 4 each of 4 designs. Stamp Set available separately. The “After Live” Drawing requires a comment on the video to enter. In order to enter, please leave a comment on the Stampin Scoop Episode 71 video on either YouTube or Facebook If you share the video on Facebook (and type “Shared”) you will receive a 2nd entry. Your videos are inspiring! 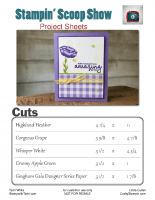 Love the downloadable project sheets! Keep up the good work ladies!